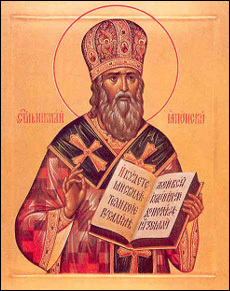 On February 16th (the 3rd by the old calendar) the Church commemorates the hierarch St. Nicholas of Japan, equal-to-the apostles. On August 1, 1836, in the Beryoza village in the Smolensk province, a son was born to the poor family of deacon Dimitry Kasatkin and was named Ivan. After losing his mother at the age of 5, the hierarch spent his youth in poverty and deprivation, which developed in him amazing willpower and purposefulness. It was these qualities which subsequently served him in good stead when, after graduating with honors from the seminary and the St. Petersburg Theological Academy, he embarked upon his life’s work as the Apostle of Japan. In June of 1860 Ivan Kasatkin was tonsured with the name of Nicholas, and that same month he was ordained a hieromonk and became a missionary. Arriving in Japan to take up the position of rector of the Russian Embassy church and to preach Orthodoxy, the hierarch was forced to overcome unimaginable difficulties in his missionary work: a ban on the preaching of Christianity under threat of death; the Japanese people’s hostile attitude towards foreigners; not knowing the Japanese language. Overcoming all impediments with God’s help and indefatigable work, the hierarch learned Japanese and translated church service books into that language; established the Russian Ecclesiastical Mission and an attendant seminary and school for women; built the magnificent Church of the Resurrection in Tokyo; converted to Christ a multitude of Japanese, from whose midst there issued the priests and confessors of the Japanese Orthodox Church, which toward the end of the hierarch’s life numbered 33,000 people. One of the first Japanese converted to Orthodoxy by the saint was a certain Savabe. This new Saul, who turned into Paul, was a Shinto priest who enjoyed universal respect and lived an extremely comfortable life. One day he came to see the Russian priest only in order to express his disdain and hate for the Christian faith. Starting off in severe and mocking tones, he gradually became more and more pensive as the conversation progressed. On the following day Savabe came again, and at the end of the conversation he asked to be instructed in the Christian teaching. A year later Savabe brought his friend, the physician Sakai, to see St. Nicholas. Yet another year later they were joined by the physician Urano. Much later, when they were being baptized, they were given the names of the apostles: Paul, James, and John. In 1875 Paul Savabe was ordained a priest, and John Sakai became a deacon. In 1880 St. Nicholas became the first bishop of Tokyo, while in 1906 he was elevated to the rank of archbishop for his hierarchical and ascetic labors. Despite these obvious signs of favor on the part of the higher church authorities, to the end of his days he served as an example of absolute humility. On February 3, 1912 St. Nicholas peacefully reposed in the Lord, mourned by tens of thousands of Japanese believers. From the time of his death and up to the present, St. Nicholas is venerated in Japan as a great saint and a special intercessor before God. Moreover, he is only the third Russian saint – after the holy Princess Olga and the holy Prince Vladimir, – to be glorified as an equal-to-the-apostles.